I second you, paint it black. I Cuaron's take on the magical world. His film and Mike Newell's I love best. In my opinion, they both added their own magic to Rowling's world, while Yates introduced so many unnecessary plot changes (whilst missing plot that would have brought the story forward ). Tom Hiddleston as Mr Scamander is a tantalising idea . I would LOVE Jeremy Irons to get involved Maybe as an older Scamander? I just searched for updates on this (no luck) but I did find this article from May 2014, which is funny because it comes off as a Muggle reporter trying to make sense out of replies that are alternatly given from the point of view of who Newt is in the Wizarding World and explanations a Muggle could understand. So for a laugh, check this out: Make Way for Newt Scamander. It's exciting and fun that these kind of news are surfacing. Thanks for finding it and sharing! I know nothing of this actor, but he looks kind. Anyone who have seen him in anything? Actually, I have. I just realised that he played Marius in the film Les Miserables in 2012. So that's why he looked oddly familiar! What do you guys think of this casting? I think Eddie Redmayne will be perfect as Newt. I am so excited to finally hear some news about this project. However it is going to be a long wait for it to reach the big screen! (Nov. 18, 2016) Thanks for posting this great news, roonwit! So what do you think? Do you like the look of the new film? What are your thoughts about the plot? Does it sound like an exciting film, or were you hoping for something different? What do you think about the new American word for Muggle? Do you think it will catch on amongst modern Americans in the wizarding world? Can my smile get bigger? Thank you so much paint it Black for these links! I think I am in many ways more excited about this movie than I am about the upcoming play. Perhaps it is because I know I will get to see this! It will be a whole new story and I am sure it will give us Potterphiles lots of new information. I really don't want to speculate on the story as I just know it will be JKR's vision and therefore the authentic story she creates about this magical world. The plot as stated in these articles doesn't give you much information, but what it does indicate is that It will be a rollicking great story which I can't wait to see! The American equivalent of Muggle, sigh, it doesn't seem half as exotic as 'Muggle'. 'No-Maj', For my way of thinking does come awfully close to a distorted version of ' No-Marge' as in No Aunt Marge? Ah yes, I think I have made a reach too far, perhaps? Anyway it will be lots of fun putting all this new information together with what we already know about the magical world. Hmm, wonder if we will learn of a magical American Academy? Thanks for the links, paint it Black! I like that they've played with the "S" in the logo, it makes it an interesting looking one. And I agree that it has a kinship with the HP logo of WB's. So far so good, but at the end of the day it's just a logo that gives away nothing about the plot. The other links holds more info, and I am glad I finally know who Porpentina and Queenie are, as previously any news on them meant nothing at all. The synopsis of the plot was by far the most interesting piece of info to me. Don't you just love those extensive suitcases/bags and so on...? 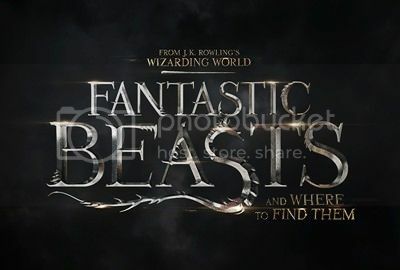 I do look forward to this movie, as it will be a revisit to the Wizarding World (however much it takes place in a MUGGLE(!) area. The American equivalent of Muggle, sigh, it doesn't seem half as exotic as 'Muggle'. 'No-Maj', For my way of thinking does come awfully close to a distorted version of ' No-Marge' as in No Aunt Marge? Ah yes, I think I have made a reach too far, perhaps? Unfortunately, I am with you all the way. Muggle is so well known and accepted, why ditch it? Do wizards absolutely have to make English the same obstacle course as the MUGGLES ( ;p ) do? Hmm, wonder if we will learn of a magical American Academy? The Salem Witches' Institute isn't a school, but a joke on the Women's Institute in the UK. I do like the abandoned idea of a pretend wildlife film on magical beasts though. I also think it might be a bit cruel to keep animals in a suitcase particularly as it seems from Hermione's beaded bag that they might get thrown around if the bag is dropped. Oh, I hadn't seen that. Thanks for clearing that up! What is the Women's Institute in the UK? Can you or some other Brit explain? Well, in theory such a film might be good... but according to that idea, it would have been WB's script and WB's idea, rather than Jo's. On balance, I'll take my chance with Jo's script. As for the bag, maybe there are compartments within - to keep them separated - and an anti-shaking Charm at place? Also, my second thought on your bag comment was a reflection on the greatness of this wizarding world: I love the detail with which it's been introduced to us , why else would we even reflect - much less care - of this aspect to a pre-synopsis for a movie?! I just surfed by Pottermore, and they have more information about the Beast movie in a piece they call Everything we've learned about ‘Fantastic Beasts' this week, which is interesting because it holds a HUGE AMOUNT of more info than I've learned from any other source! So, SPOILER ALERT to a level: Read only if you don't mind knowing more about what the plot is about and more about the characters and more as well: New info on Fantastic Beasts! Today, the Pottermore Correspondent addresses the fact that somewhere near Leavesden [I assume], there has popped up a significant part of New York in 1926! Did they use a bold combination of combined Time-Turner and PortKey? Maybe not.... Fantastic Beasts has its own New york City. A couple of behind the scenes images from Fantastic Beasts can be found here on Pottermore. "The image" on top, is really a slideshow, if you put your mouse on either end, arrows appear. No idea, what he's really doing. I wonder if there'll be a Beast in front of him in this scene in the film? Apparently they were filming in Liverpool this week according to Pottermore's article. When Colleen first met the character, he was a collection of J.K. Rowling's words in a script, waiting for an actor to inhabit him. Stunt coordinator Eunice Huthart on Redmayne's daredevil streak. This featurette is pretty cool: https://www.youtube.com/watch?v=qrp9wVO_74U. I had hoped to stay more spoiler-free than what they explain in this (though all they really do is talk through the main characters a bit and confirm impressions given in the trailer as to plot etc.) but I suspect they'll be promoting the story so much that it'll be near-impossible to stay spoiler free until November. It does look very exciting. I can't wait. For me, this reminds me a little bit of how it was in July-October in 2002, waiting for COS the film to premier in theaters. Before OOP was published (in June 2003), COS was by far my least favourite HP book(*) and I was initially not sure I wanted to even see it as a film! But having joined a HP community in July 2002, it quickly ceased to be an option. Of course I wanted to be able to discuss it with the others! So I veered to not wanting spoilers instead, I thought... (Un? )fortunately one of the other members managed to come by incredible behind the scenes film stills of the not yet released film. It was impossible not to look and comment with the others. But when I came to the theater I already knew how Lockhart, Fawkes, Myrtle,... looked. I mourned that a little. But at the same time I might not have been so excited about the COS film otherwise. Those images sure changed that - and I'm glad they did! I think this situation is similar, because they need to get fans truly excited about the film whose intricate plot details no one knows. It's not a story that we all already love and 99% of all fans can not wait to see. We're sort of excited (by comparison) because it's from HP's magical world and written by Jo, but the story itself is unknown. So they give us promising titbits that are, this time, our sole information about the plot and its look and feel. Thanks for the link, HealerOne! The Secret Life of Movie Extras which I thought was fun and interresting (although there is NO Newt info at all).